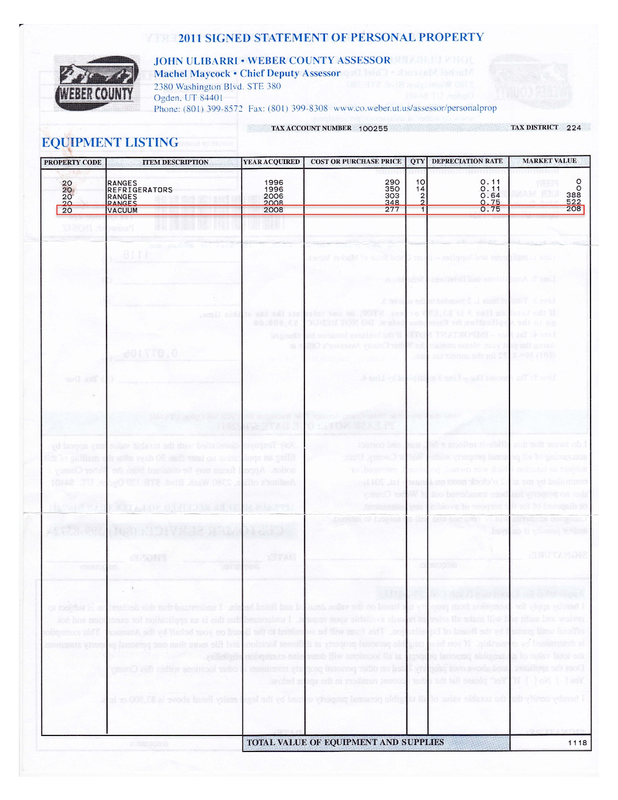 In filing my Personal Property Tax Statement with the Weber County Assessor, I noted that Kier Property Management had included a vacuum cleaner on the inventory list that had been purchased in 2008 for $277. 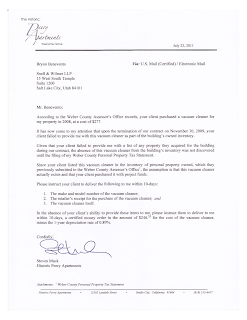 Since Kier failed to provide me with this vacuum cleaner upon the termination of our contract together, I asked their attorney to have them provide me with the vacuum cleaner and the retailer's receipt showing proof of its purchase. 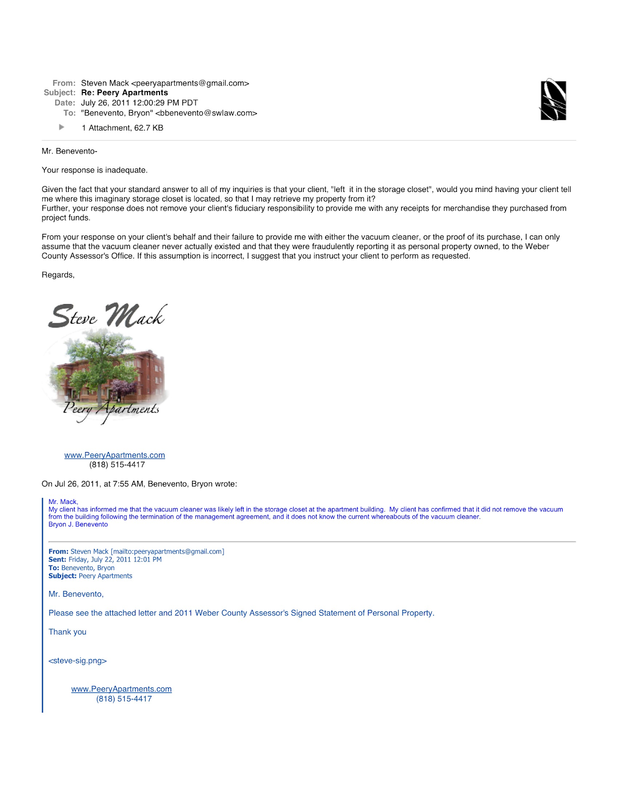 In this reply, I informed Kier's attorney that his response was inadequate and that Kier still had a fiduciary duty to me, to provide me with proof of the vacuum cleaner's purchase, because it was purchased with funds from the building's bank account. 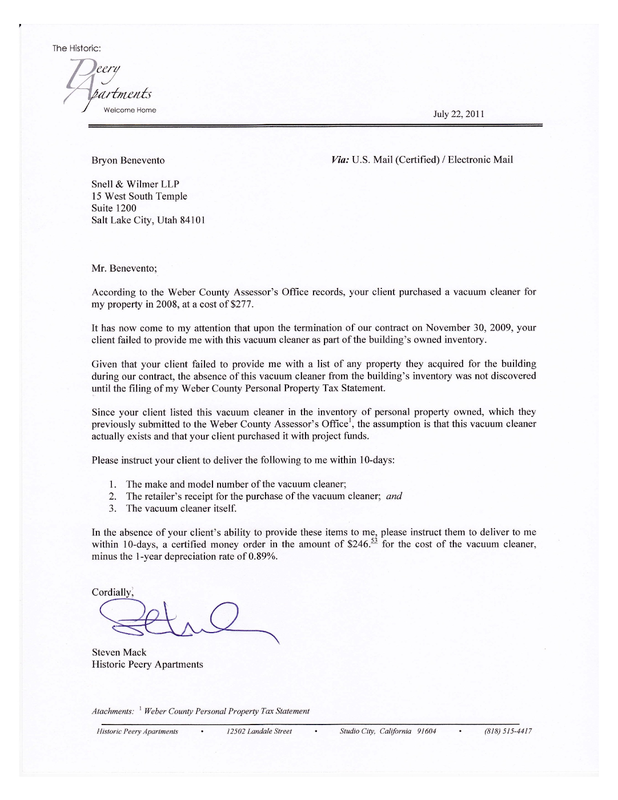 Failing to provide any proof for the purchase of this vacuum cleaner, it is likely that the vacuum cleaner never existed and that Kier was falsely including it as property owned by the project in the 2008 and 2009 Statement's of Personal Property for the building, which they submitted to the Weber County Assessor's Office. 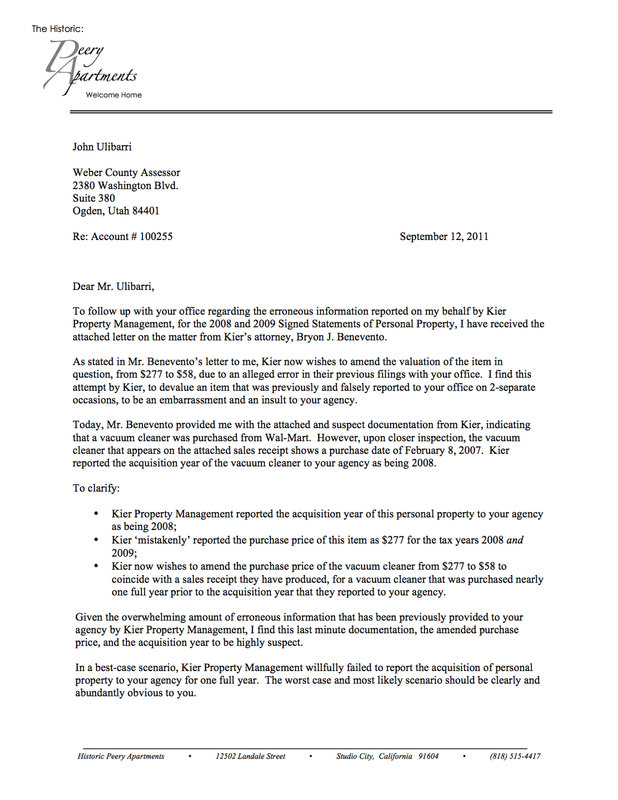 Further evidence of Kier's habit of providing a less than accurate accounting of personal property owned, is documented in Kier's Statement of Personal Property (shown above), dramatically under valuing these items and stating that the 14 refrigerators owned by the project were purchased in 1996, while model numbers on some refrigerators indicate that they were manufactured after 1996. 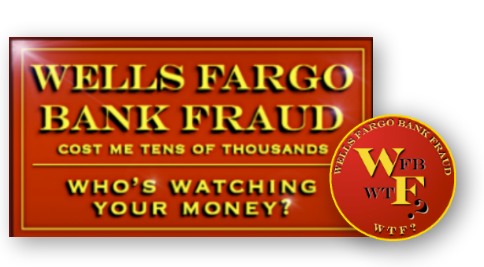 CAN YOU SAY "TAX FRAUD"? 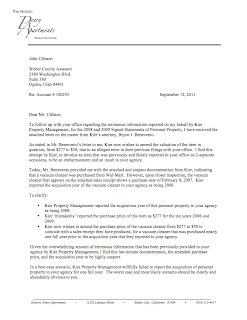 On August 1, 2011: I sent the following letter to Weber County Tax Assessor, Mr. John Ulibarri, informing him of the fact that Kier had filed false personal property tax statements on my behalf for 2 consecutive years. 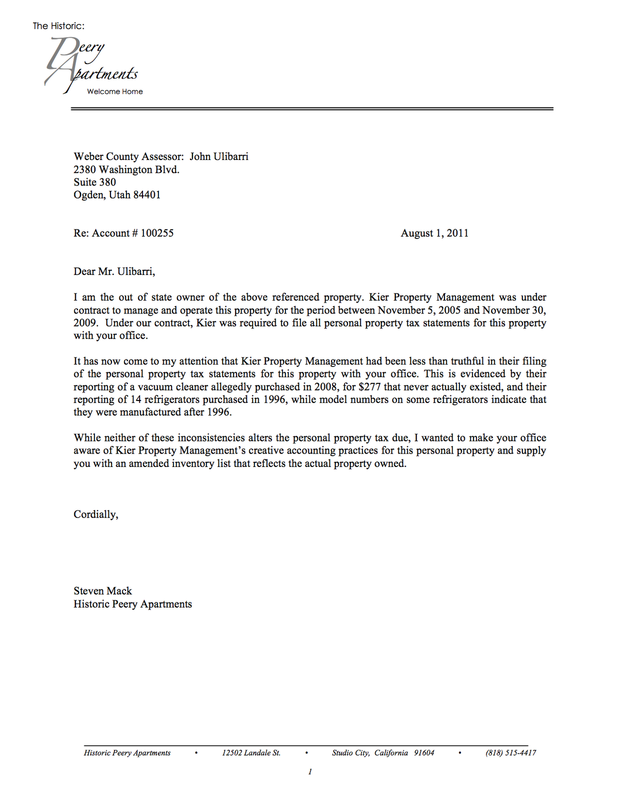 On August 16, 2011: I received the following letter from Kier's attorney, stating that an "error" had been made in Statement's of Personal Property submitted to the Weber County Tax Assessor's Office, with regard to valuation, along with a check in the amount of $14.34, refunding the amount of the "over payment". 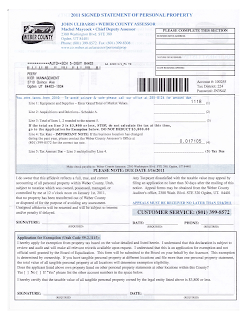 On September 12, 2011: I received this Wal-Mart receipt for the purchase of a vacuum cleaner from Kier's attorney. 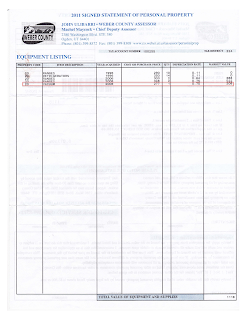 Note the purchase date of February 8, 2007. 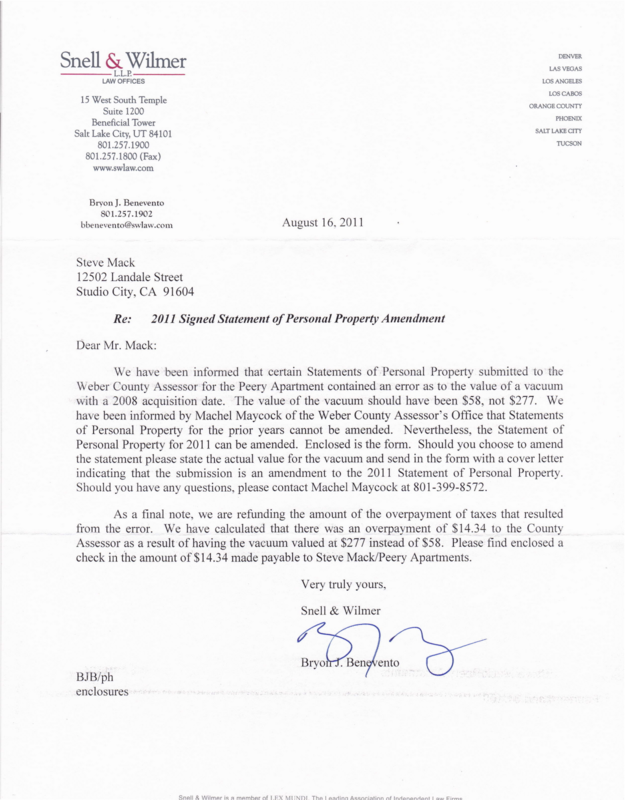 Clearly this was Kier's sloppy attempt at covering up the fact that they had lied on the 2008 and 2009 Statement's of Personal Property, which they submitted to the Weber County Assessor's Office. 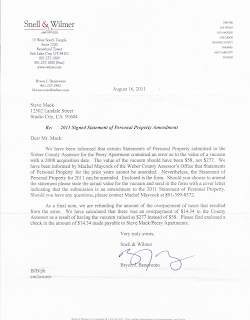 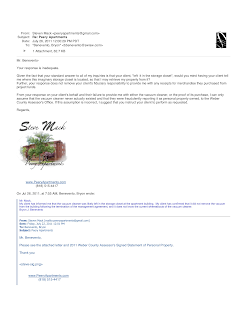 On September 13, 2011: I sent the following letter to Weber County Assessor, John Ulibarri, informing him that I find this new documentation from Kier highly suspect, given the information that was previously reported by Kier. 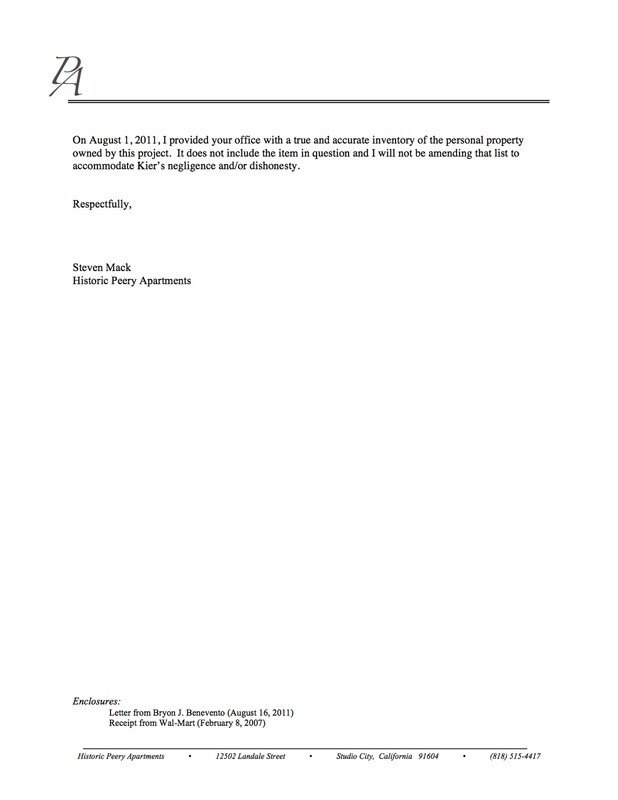 correspond with the Wal-Mart receipt. The purchase price shown on the Wal-Mart receipt is $54.92. 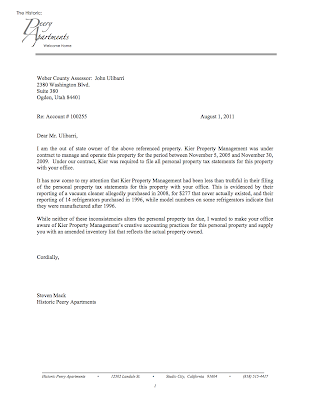 Kier's attorney tried to amend the purchase price to coincide with the Wal-Mart receipt. 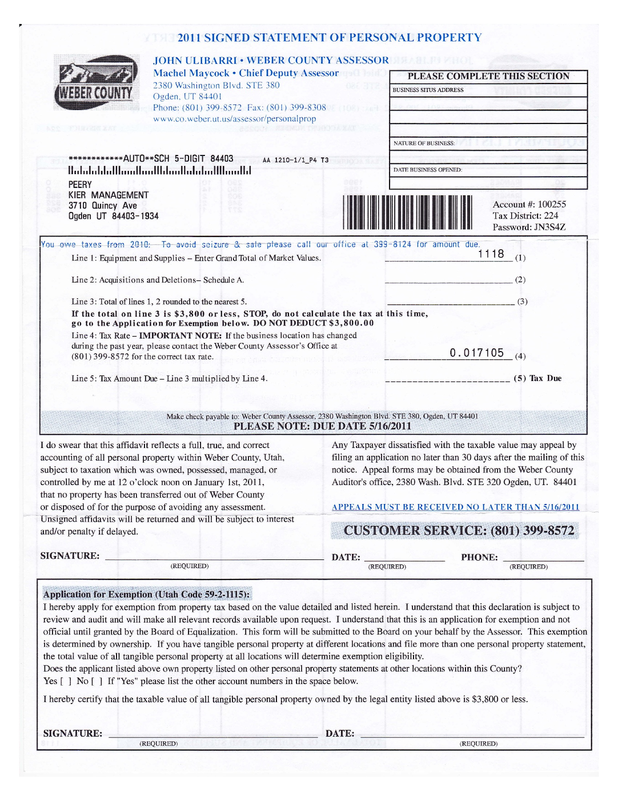 In all likelihood, Kier found a receipt for a vacuum cleaner in the files of one of the other buildings they manage and tried to pass it off as the receipt for the vacuum cleaner they reported to the Weber County Assessor. 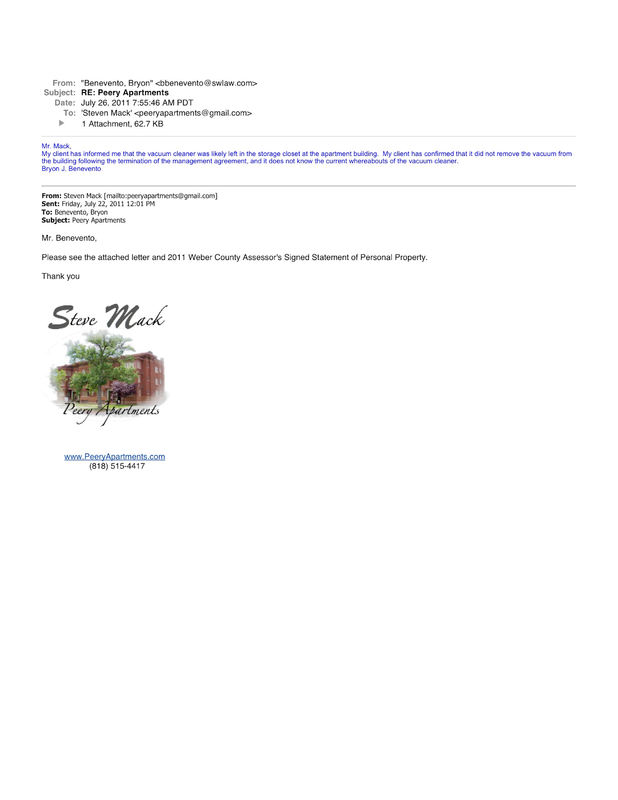 In the best case scenario: Kier willfully failed to report the acquisition of this personal property to the Assessor for one full year. 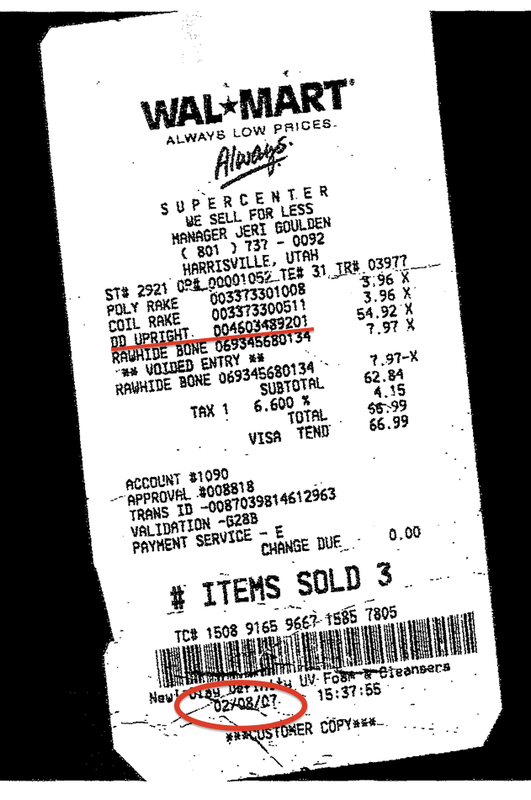 In the worst case, and most likely scenario: Kier never purchased a vacuum cleaner for my property and when caught in their lie, attempted to pass off this Wal-Mart receipt and devalue the non-existent item they reported to the Assessor to match it. 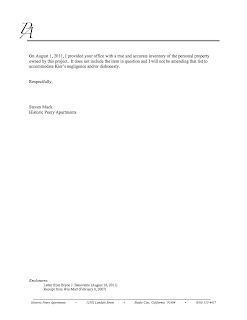 The folks at Kier Property Management are liars. 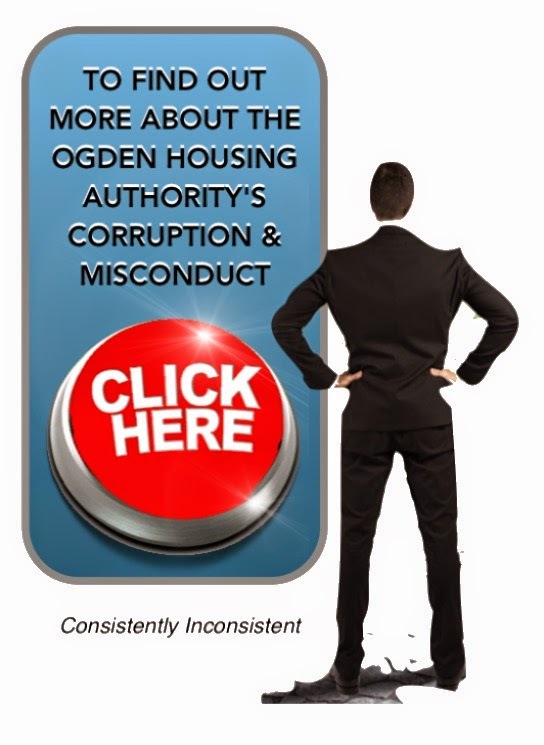 They feel that they are entitled to operate above and outside of the laws that the rest of us are required to live by and pay their attorneys a handsome sum to keep things that way.